Marmaduke was the son of Ralph Rawdon (or Roydon) of Brandsby in North Yorkshire, by Jane, daughter of John Brice of Stillington. He was baptised at Brandsby on 20th March 1583. At sixteen years of age, Rawdon went to London, where he was apprenticed to Daniel Hall, a Bordeaux merchant, who sent him, as his factor, to France. This gave him a knowledge of French. He returned to London about 1610 and was elected a common councilman. Soon afterwards, he was presented with the freedom of the Clothworkers' Company and made captain of the City Militia. In 1614, he joined a mercantile venture to the New England Coast, sending out two ships under Thomas Hunt and John Smith, which sailed from the Downs on 3rd March 1614. Rawdon was keenly interested in the discovery of the North-West Passage. He was one of the first settlers or ‘planters’ in Barbados, where he is said to have buried above £10,000. He also adventured to other parts of the West Indies and to Spain, Turkey, and the Canaries in the Old World. In 1629, he became MP for Aldborough in North Yorkshire. In the Civil War, he fought as a colonel on the King's side, raised a regiment at his own cost and commanded the successful defence of Basing House in Hampshire in 1643. On 28th December of the same year he was knighted. 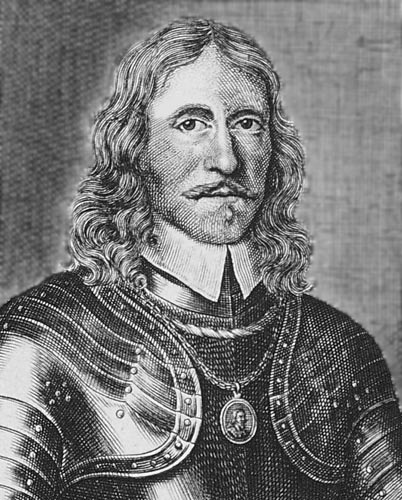 After Sir George Lisle's recall to the King's headquarters in Oxford in May 1645, Rawdon left Basing with a force of 50 horse and 450 foot soldiers to become Governor of Faringdon in Berkshire, a strategic point in the defensive ring around that city. With his Faringdon forces, he took part in a number of skirmishes at Highworth, Lechlade, Bampton and Radcot Bridge. In April 1646, these were followed by the Second Siege of Faringdon when Parliamentary forces infiltrated the western end of the town and set up a defensive earthwork. Rawdon's counter attack captured this, but his men suffered heavy casualties. A second push from the south was also stopped, but the enemy eventually managed to establish a gun battery in the east, commanded by Sir Robert Pye Junior, whose absent father usually resided at Rawdon's seconded headquarters, Faringdon House. There was a heavy bombardment against Rawdon's snipers up the church tower in an attempt to topple the steeple into the Royalist lines. Aware of the danger, Rawdon had it blown up to fall in the opposite direction; but, by this time, the colonel was sixty-three and seriously ill. He died at Faringdon House on 28th April 1646 and was buried with full military honours, including cannon and musket-fire, in the nave of Faringdon Church. The building took a direct hit from a 200-pound Parliamentary mortar shell shortly after the funeral had ended. In 1611, while a ‘clothworker of All Hallows Barking,’ Rawdon had married Elizabeth, daughter of Thomas Thorowgood of Hoddesdon in Hertfordshire. His son, Thomas, also fought as a colonel in the Royalist Army and, after the Battle of Marston Moor, found asylum in the Canary Islands. His nephew, Marmaduke Rawdon, the antiquary, lived in his house for some years from 1626. Edited from Leslie Stephens & Sidney Lee's "Dictionary of National Biography" (1897).